Exclusive: Labour members warn their leaders that the party’s Brexit plan would torpedo its manifesto. 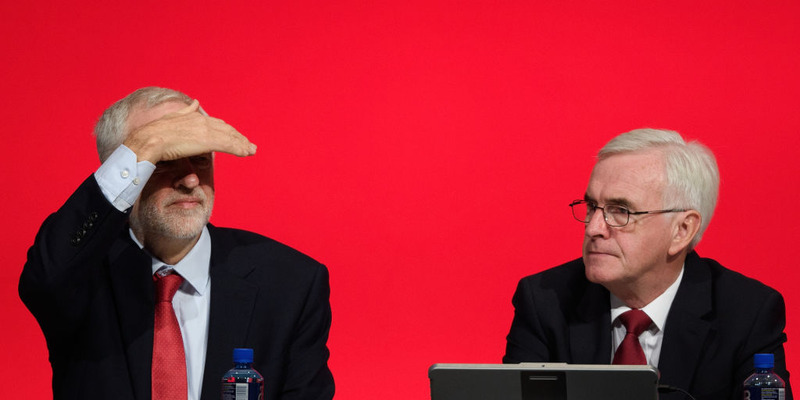 In a letter sent to Shadow Chancellor John McDonnell on Tuesday, anti-Brexit campaigners in the Remain Labour group said that Labour’s updated Brexit policy would result in the UK losing around £24 billion a year over a decade. This would force Jeremy Corbyn to ditch many of his anti-austerity spending promises, the letter said. Economist Jonathan Portes said the letter was „a fairly good approximation of what Labour policy would deliver“ if implemented. Corbyn has vowed to support a Brexit deal which includes a permanent customs union, close links with the single market, and EU-level workplace and environmental rights. However, he is under growing pressure to take a tougher stance against Brexit and back a new referendum. LONDON — Jeremy Corbyn’s Brexit proposals would torpedo his spending plans and deprive an incoming Labour government of billions of pounds in lost revenue, anti-Brexit campaigners in the party have warned. In a letter sent to Shadow Chancellor John McDonnell on Tuesday and shared with Business Insider, the Remain Labour group — which represents pro-European Labour activists nationwide and is backed by a cross-section of Labour MPs — warned that the party’s revised Brexit plan would hamstring a Labour government’s spending power. Last week, party leader Corbyn wrote to Theresa May, urging her to accept Labour’s Brexit plan of a permanent customs union, close links with the single market, and EU-level workplace and environmental rights. However, the letter sent today warned McDonnell that this sort of Brexit would lead to the UK losing an estimated £24 billion a year over a decade, citing London School of Economics (LSE) and Kings College London research. „Labour’s plan set out in the letter to the Prime Minister would cost the economy £24billion per year and devastate Labour’s 2017 manifesto spending plans,“ the Remain Labour group told McDonnell. The letter — which has been sent to McDonnell and every other Labour MP — stressed that £24 billion a year is over half of the £44 billion annual increase in public spending promised in the party’s 2017 manifesto. This economic damage would stifle a Labour government and force it to „ditch a wide range of anti-austerity policies that could include schools, welfare and pensions, childcare and the NHS,“ Remain Labour said. It would sink some of Corbyn’s most eye-catching manifesto promises, the letter added, pointing to the estimated £9 billion it would cost to abolish tuition fees and £4 billion for improvements to the welfare state. Andrew Lewin, founder of the Remain Labour group, told BI: „This analysis must serve as an urgent wake up call. If the party leadership chooses to pursue a ‘Labour Brexit’, the outcome will be Labour austerity. The Remain Labour letter accused the Labour leadership of abandoning party policy of „full participation in the single market,“ which was agreed by party delegates at the most recent Labour conference in September. Labour’s policy is „close alignment“ with the single market, which campaigns said betrayed the conference agreement. „We have taken this to mean that Labour’s policy is to leave the single market,“ the letter to McDonnell said. However, the Labour leader is currently trying to work with May on a revised Brexit deal, while his inner circle believes that backing a new referendum would go down badly among the voters they need to win at the next election. Senior Labour sources on Monday denied reports that Corbyn’s office had edited his recent letter to the prime minister to remove a reference to a new referendum allegedly inserted by Shadow Brexit Secretary, Sir Keir Starmer. I am writing as the founder of the grassroots Remain Labour campaign. We’re an organisation of Labour voters and members who are campaigning for our party to embrace a People’s Vote and campaign to Remain in the EU. Jeremy Corbyn’s letter to Theresa May last week set out five demands that must be met if Labour is to support a Brexit deal. We have analysed the economic implications of the terms and as a result, are writing urgently to you as Shadow Chancellor. Labour’s plan set out in the letter to the Prime Minister would cost the economy £24billion per year and devastate Labour’s 2017 manifesto spending plans. Crucially, the form of words in Jeremy’s letter says Labour wants, ‚close alignment with the single market.‘ We have taken this to mean that Labour’s policy is to leave the single market. This is despite our motion agreed at conference calling for ‚full participation‘ in the single market. The 2017 Labour manifesto committed to £44billion per year in extra spending. If we are not members of the single market, the £24billion Brexit hit to the economy will take out more than half of the 2017 spending commitments. Even if you dropped both of these plans, there would still be an £11billion hole in our finances, risking spending promised on the NHS, schools and childcare. Alternatively, you’d need to raise income tax by an unprecedented 6p in the pound to meet the shortfall. I’m sure you agree that a £24billion hit to our economy would be a disaster. It would devastate our plans to invest in the country and rebuild our public services, which are so urgently needed after years of Tory cuts. I hope you agree this analysis proves beyond doubt that there is no good Brexit deal. A Labour Brexit would mean Labour austerity. Can you please reply to confirm that as Shadow Chancellor you cannot back a plan that will cost our economy £24billion per year? I hope instead you will now support a People’s Vote and campaign to Remain in the EU.